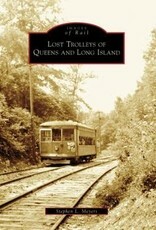 An amazing assortment of electric trolley lines once traversed the towns and villages of Queens and Long Island. With names like Jamaica Central, Northport Traction, Ocean Electric, and the Steinway lines, some meandered across meadows and hills while others sped over elevated tracks. There was even one line that had streetcars but no tracks. In the end, all of them helped stitch the countryside into the concentrated suburban area it is today--with barely a trace of the trolleys left anywhere.